Surprise your mom (or treat yourself!) 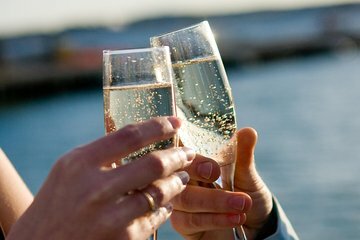 with a 2-hour Champagne brunch and cruise on New York Harbor for Mother's Day. Let her take the afternoon off and enjoy springtime views of the Brooklyn Bridge, Ellis Island, the Statue of Liberty, and Lower Manhattan. Unlimited sangria and mimosas, a lavish brunch buffet, and live jazz included on board the boat. Celebrated moms can make their way to Pier 40 in the West Village to meet the luxury yacht. Guests will be shown to their seats and have the choice of unlimited mimosas or sangria. Cruise down the Hudson River, through the New York Harbor and the East River. Sidle up to the lavish buffet while enjoying views of the Empire State Building. The boat will turn south to glide past Ellis Island and the Statue of Liberty, under the Manhattan Bridge and the Brooklyn Bridge. Moms will also get photo-worthy views of the Manhattan skyline and the Freedom Tower. Live music from a jazz quartet completes the relaxing experience, along with coffee and tea. The boat docks back at the pier at the end of your cruise.